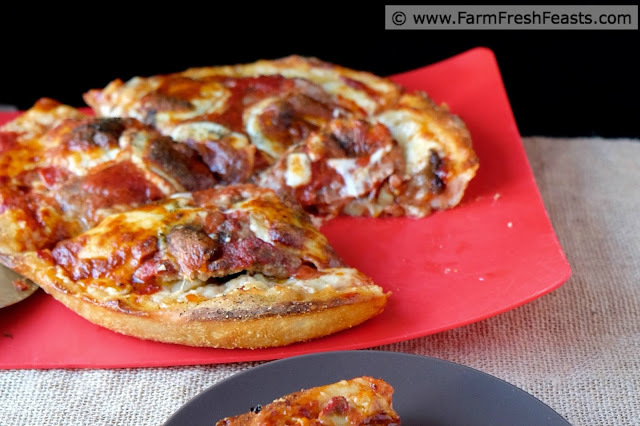 Deep dish pizza with eggplant, artichoke and pepperoni tucked under a blanket of sausage. Eggplant is a wonderful way to illustrate how life is different when you're eating from the Community Supported Agriculture (CSA) farm share. 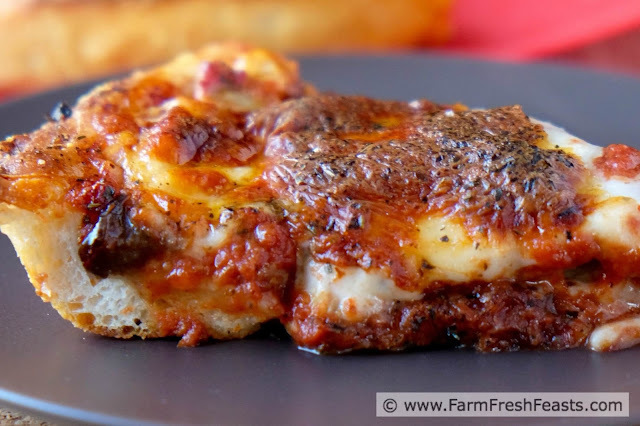 If the only way you know to eat eggplant is Eggplant Parmesan, what do you do when you have a farm share and get 3 eggplants per week for 4 out of 5 weeks in a row? I suppose you could make a weekly pan of eggplant parmigiana. I hear it freezes fine. Or you could share it with friends who need a bit of love through food. Or me! If you're looking for alternatives, though, think about grilling slices of eggplant, baking eggplant chips, or roasting cubes. Amazing flavors and endless possibilities. Please check out my Eggplant Recipes Collection, part of the Visual Recipe Index by Ingredient. I will be updating it like I've done with beets and kohlrabi, including recipes from other food bloggers to generate a useful resource for folks like me eating from the farm share. Folks who may not feel like eating a pan of eggplant parm once a week in July and August. /rant, on to the pizza! This pizza is kind of semi-homemade if I'm allowed to use that term. 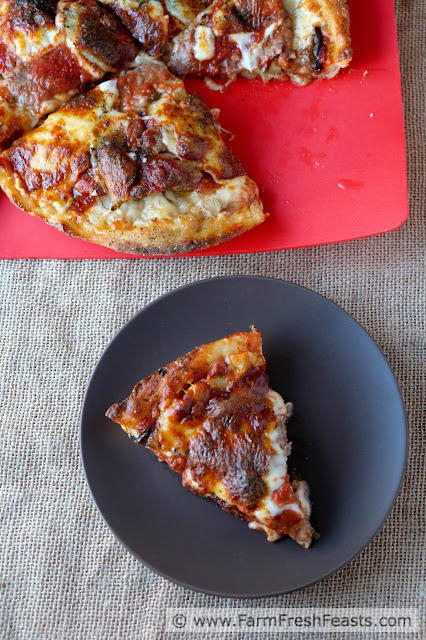 I bought the premade dough and sauce [ok, if you want to be technical about it I bought the eggplant by purchasing a farm share, picked up the artichokes on a Costco run, and grabbed the cheese, pepperoni and sausage during a grocery store milk run]. More to the point, though, I assembled this pizza at home out of ingredients I had on hand. My son called this Deep Dish Pizza Mach 4.0, and my spouse said "finally". 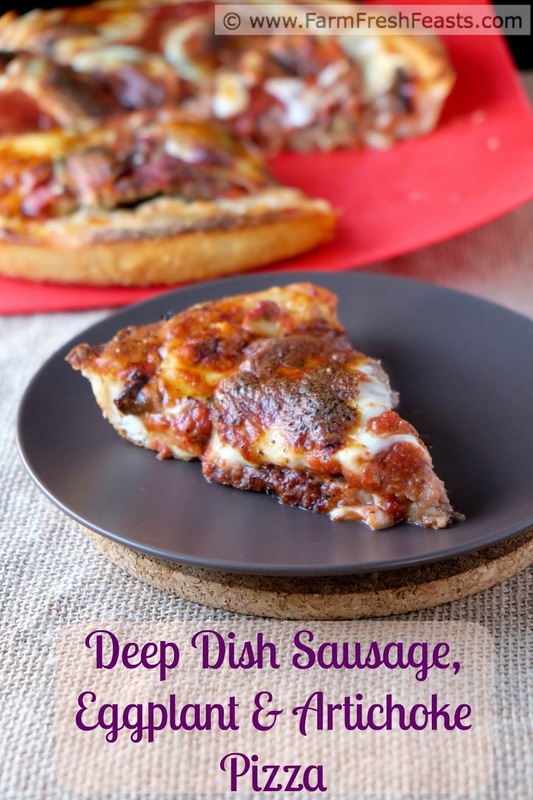 He'd liked the discs of sausage from my first deep dish pizza explorations [chronicled with gifs in How Not to Make Lou Malnati's Chicago Style Deep Dish Pizza] and requested more. I didn't have any Italian sausage--so per his request I substituted breakfast sausage. 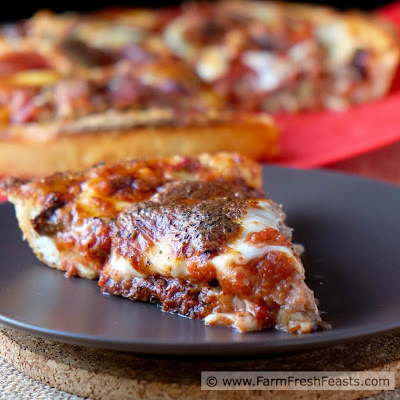 Making this pizza proved to me [so I can share with you] that using what you've got on hand can make tasty pizzas at home--even deep dish style. Expect to see more in the future. Note: This recipe uses leftover baked eggplant chips. I followed this recipe from Blenheim Organic Gardens, our old farm share in Virginia, and topped them with feta cheese after flipping. This summer I've been throwing the farm share on the grill, so I'm grilling my eggplant chips, not baking them, but this post was created last Fall to be shared now so you get what I did then! 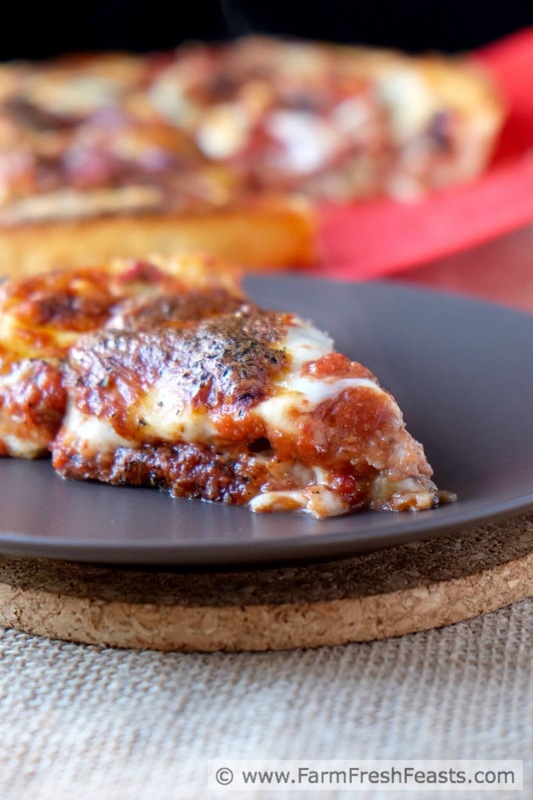 Preheat the oven to 450 degrees Fahrenheit and swirl oil around a 12 inch cast iron skillet. Sprinkle with cornmeal, then push the pizza dough across the bottom and up the sides of the skillet. Use enough of the sliced cheese to create a layer of cheese across the dough. Top with the vegetables, pepperoni and sausage. 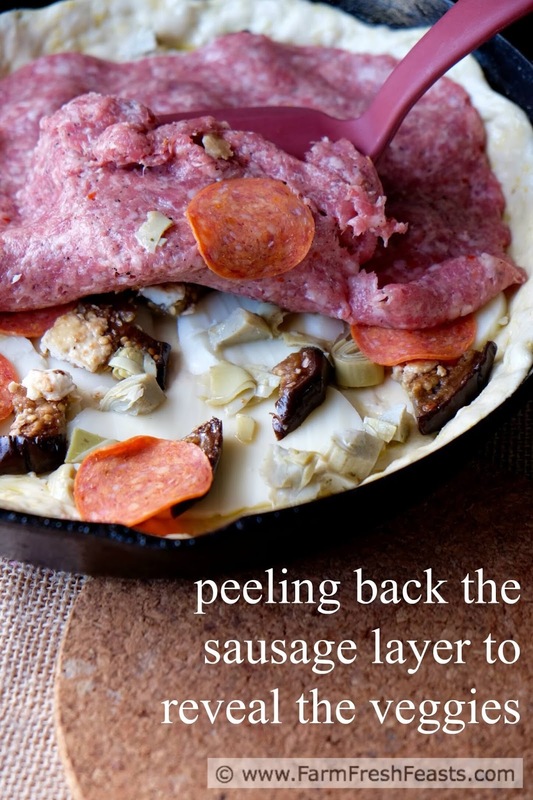 Spread sauce across the sausage, top with remaining cheese, and sprinkle with seasonings. Place in preheated oven, reduce oven temperature to 425 degrees, and bake for 25 to 30 minutes until cheese is browned and sauce is bubbly. I have yet to get an eggplant in the farm share this year. Weird. Eggplant chips are an excellent snack. Just like roasted green beans or grilled butternut squash, it's something I can't help but pick off of the tray after cooking and before serving. Kristen - this looks so delicious. Love all those yummy layers. I made a Roasted Veggie Mediterranean Tortellini dish last week inspired by a recipe I saw in the King Arthur catalog. I'd forgotten how much I love eggplant. Would love to give this recipe a whirl! I need to start getting that catalog again--that dish sounds delicious. I love deep dish pizza. 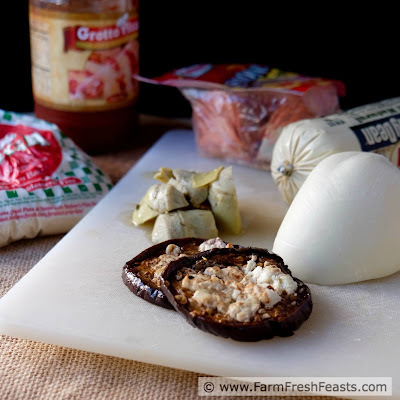 The addition of eggplant here is a great idea! Yum! Now that I can make a deep dish, I am glad to have this technique in my pocket and we enjoy deep dish pizza much more often. What a fantastic way to use eggplant, Kirsten! And now I know about eggplant chips :-) I really want to make this! Eggplant chips and a love of fresh figs--two of the many things that stuck with me from our years enjoying Blenheim Organic Gardens while we lived in Virginia.